With only a few weeks of worktime left till the holiday zero hour, I thought I’d check out a few toy-making books and try my hand at building something smaller than a pony for a change. 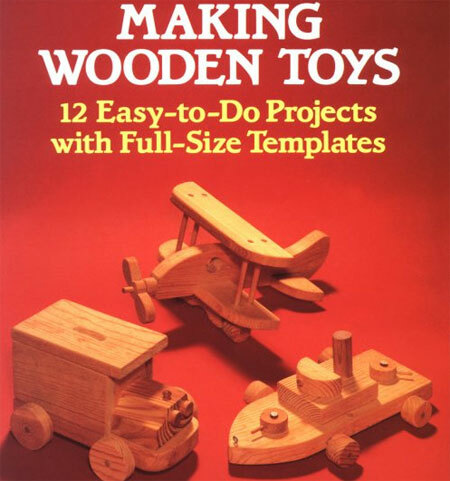 Making Wooden Toys: 12 Easy-to-Do Projects with Full-Size Templates by James Stasio caught my eye right away. His book contains templates for some easy-to-do little rigs like trucks, helicopters, and a naval destroyer. I figure for $7 and a few pieces of pine I can’t go too wrong, so we’ll see what comes of it. At least they’ll be easier to poly or paint than the huge pieces I’ve been doing. If they’re good I’ll post some pics when I’m done — and if they turn out good-for-a-laugh, I’ll post more pics. Here’s an idea – cut and sand all the pieces, then give as a gift with a set of non-toxic acrylic paints and some woodglue! Actually Rich, that’s not bad.